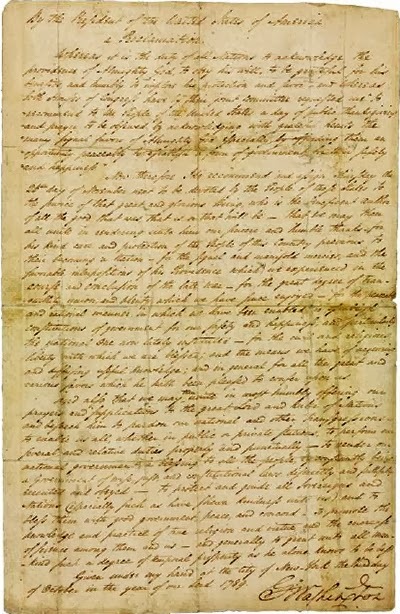 The original manuscript proclamation establishing the first federal Thanksgiving Day in the United States of America is being offered by Christie's-New York on Thursday evening November 14, 2013 in a single-lot special event sale. Signed by George Washington on October 3, 1789 it is estimated to sell for $8,000,000 - $12,000,000. Prior to its sale, the proclamation will be on tour, exhibited October 17-20 in Los Angeles at the Reagan Library; October 22 in Dallas at the Harlan Crow Library; October 24 at Christie's-Chicago; October 30 in Boston; November 4 in Washington, D.C. at the Library of Congress; November 5 in Philadelphia at the National Constitution Center; and November 7-13 in New York at Christie's Galleries. The proclamation followed the request to President Washington by the House and Senate, on the day after ratification of the 1st Amendment to the Constitution, to proclaim a day of thanksgiving for “the many signal favors of Almighty God." Congressman Elias Boudinot of New Jersey said that he “could not think of letting the session pass over without offering an opportunity to all the citizens of the United States of joining, with one voice, in returning to Almighty God their sincere thanks for the many blessings he had poured down upon them" (The Annals of the Congress, The Debates and Proceedings in the Congress of the United States 1, Washington, DC: Gales and Seaton, pp. 949–950). Massachusetts Centinel, October 14, 1789. This was not the first time that a day of thanksgiving had been proclaimed. On October 11, 1782, John Hanson, first president of the newly independent United States under the Articles of Confederation, declared the fourth Thursday of every November to be a national Thanksgiving Day. The holiday, however, was by the authority of each state, not the national government. Under the new Constitution it was to be a federal holiday. But not an annual observation. George Washington again proclaimed a Thanksgiving Day in 1795. John Adams declared Thanksgiving Days in 1798 and 1799. In response to resolutions in Congress at the close of the War of 1812, James Madison renewed the tradition in 1814 and 1815. But it was not until Abraham Lincoln proclaimed a national Thanksgiving Day on October 3, 1863 to occur in November of that year that the holiday has been annually celebrated. Washington's proclamation is a foundational document in the history of the United States of America's grand national tradition of Thanksgiving. One of the great documents of Americana, it's no turkey. Document images courtesy of Christie's, with our thanks. Newspaper clipping courtesy of the Washington Post, with our thanks.